After registering, you’ll be directed to start your first campaign. 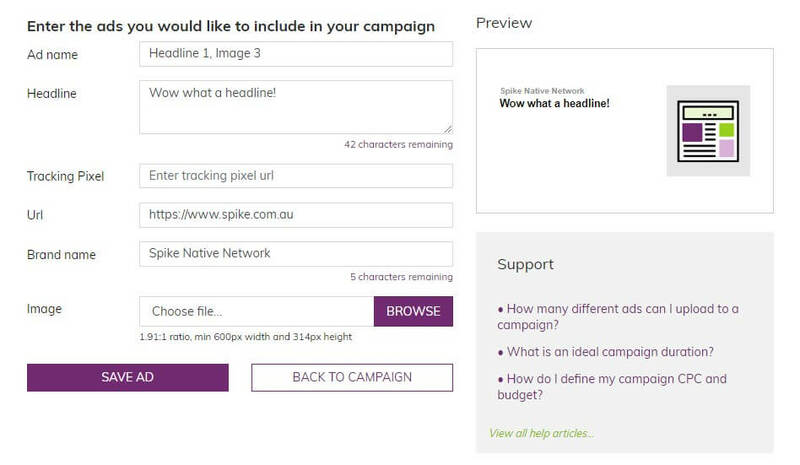 The setup page is an important first step in defining the parameters of your campaign. Set a name for your campaign eg. “March Sale”, the start and end dates for the campaign and how you would like the campaign to be run, via Cost Per Thousand Impressions (CPM) or Cost Per Click (CPC). Your required Impressions/Clicks will automatically generate the budget for your campaign. You can also deselect a maximum of two publications across the network which ads will not be shown too. Now let’s create an Ad! After you have set up a campaign, setting up a few different ads to test different creative is the next step. It’s important to test a number of headlines and image combinations to make sure your reaching as much of the Spike audience as possible. We recommend starting with a number of ads firing and gradually turning off poorer performing ads once its obvious there are a few best performers. We’re happy to help build out headline and image ideas with you, just let us know! The preview box on the right hand side will pre-populate with your ad particulars, giving you an understanding of what your ad will look like before it is saved. Once your happy with your ads, press launch, enter your payment details and your all set! We’ll check everything is working properly and launch your campaign that business day. 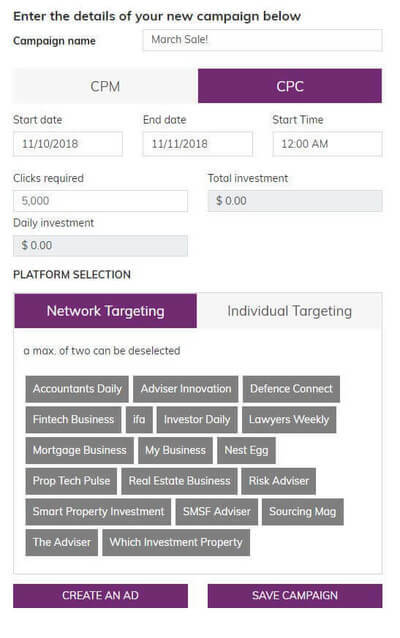 Spike charges only for actual clicks delivered – not a campaign budget. Credit cards are charged on a weekly basis, and invoices monthly. There’s a million ways to frame your product, but cutting through and reaching out can be harder than it looks, so here’s the most important factors to consider. We go into some serious detail within our blog. You have a short period of time to grab the audience’s attention, so get them engaged from the beginning and keep them interested. Make sure what you are writing about is relevant to the audience you are trying to connect with and is applicable to the current times. It is best to research trends within your industry, discussions currently playing out, and any roadblocks in the industry that your business can assist our users with. Keyword research on your industry can be provided if you need – contact your account manager for further details. The goal is to create a favourable impression of the sponsor based on the quality of the content. For example, native advertising might cover best practices or challenges facing business consumers in a specific area -, the information should be objective and informative, not promotional. The description of a single product or product line, the capabilities of a company, etc., is not appropriate for native advertising. Similarly, a product release or product literature would not be appropriate. A well-researched case study, on the other hand, could qualify for a native advertising campaign. All native ads will be reviewed by the Spike editorial team to ensure they adhere to these policies. If you have a great video that visually explains your point or an image that backs up your claims, include this in your content. Try to avoid stock images or images of little relevance: if it doesn’t add value than it is just a distraction. This will depend on the outcomes you are trying to achieve, but generally you want to make the article long enough to get the message across but not so long that you give it all away. Providing too much information means that the user will not move on to your own site to find out more or register their details to receive further information. After you’ve written the perfect article, make sure your readers know what to do next. Big, bold, hyperlinked words asking users to click to receive further information will ensure you get the conversions you’re looking for. Instead of text you could have a ‘button’ image designed and provided to us that will link to your landing page. Remember that this is an opportunity for you and your business to display your expertise and become a voice for the industry. Don’t try too hard to achieve that big, immediate sale. You should be providing practical and actionable advice and sharing your knowledge. Campaigns need to be refreshed. Spike has a very loyal audience who make frequent visits to our network websites, so if they have not interacted with your ad, it is unlikely they will in a month from now if it is using the same creative. We recommend swapping out creative on a weekly basis. 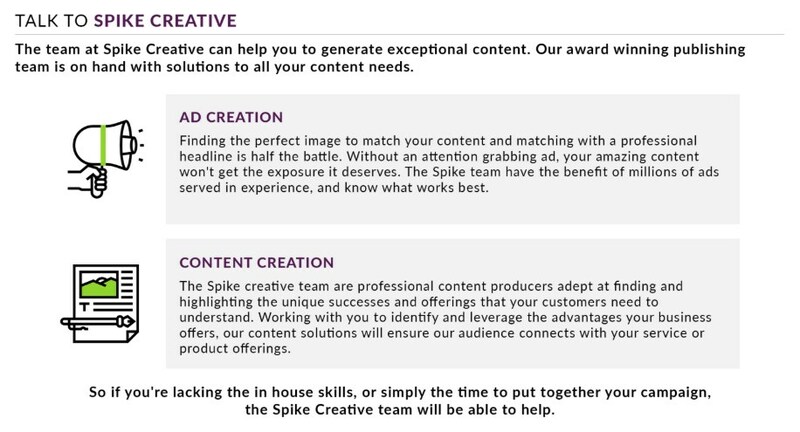 At Spike, we want you to get the best return on your campaign possible so we recommend a combination of headlines and images at the start of a campaign. Every few days we then review what is working most effectively and put more emphasis on those combinations that are working for your business. Unlike other automated systems, we don’t believe the CTR is the defining metric of a successful campaign. Would you rather have a 1% CTR with a 0.5% conversion rate, or a 0.5% CTR with a 3% conversion rate?